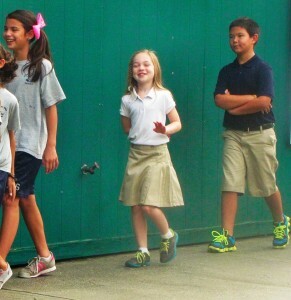 First Day of School: CDS Begins its 15th Year! You are here: Home » Blog » First Day of School: CDS Begins its 15th Year! As you read this, it’s likely that a child you know is among the 2,000 students who began the 2014-15 school year today at one of three area charter schools. Charter Day School in Leland, Columbus Charter School in Whiteville, and South Brunswick Charter School are year-round tuition-free public schools in the Charter Day School, Inc. (CDS, Inc.) family and are managed by The Roger Bacon Academy, Inc.
Today’s is a special landmark for this family of schools. It marks the fifteenth school year for Charter Day School in Leland and the very first for South Brunswick Charter School in Southport. 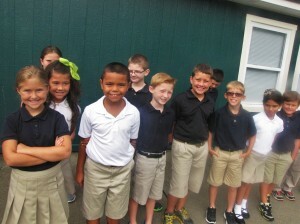 Columbus Charter School in Whiteville inches closer to the decade mark as it begins its eighth academic year. This family of schools continues to make a significant positive impact in the southeastern NC region, this year reaching a record cumulative enrollment of more than 2,000 students. In addition to the three year-round schools opening today, CDS, Inc. also operates Douglass Academy charter school in downtown Wilmington, which follows a traditional schedule beginning on August 26th. Douglass is still accepting applications at www.douglassacademy.net or by phone at 910-763-1976.
nction and both schools’ EOG test scores consistently top their respective counties’. The schools also offer a cheer program that, in December, won its fifth National title in competition in Orlando, Florida. The Charter Day School Archery team was this year’s State Champion for the fifth time in a row and has made appearances in World competitions. Batten adds, “Having a dded two schools to our family in two consecutive years adds twofold excitement for the near future. First, having added two more schools without receiving county facility bond funding is a tremendous saving for our tax paying citizens. Second, gaining two new student populations to teach with Direct Instruction and Classical curriculum allows us to offer this as another choice to more parents. This combination of tax savings while providing a proven academic model means more children in our area are going to great schools and getting a great education”.